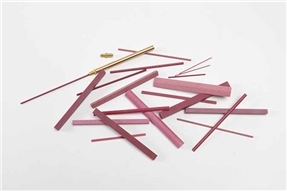 Falcon Tool offers a wide variety of Ruby Degussit Abrasive Files. These stones are made from a pure, synthetic polycrystalline ruby - no bonding agents are ever used. 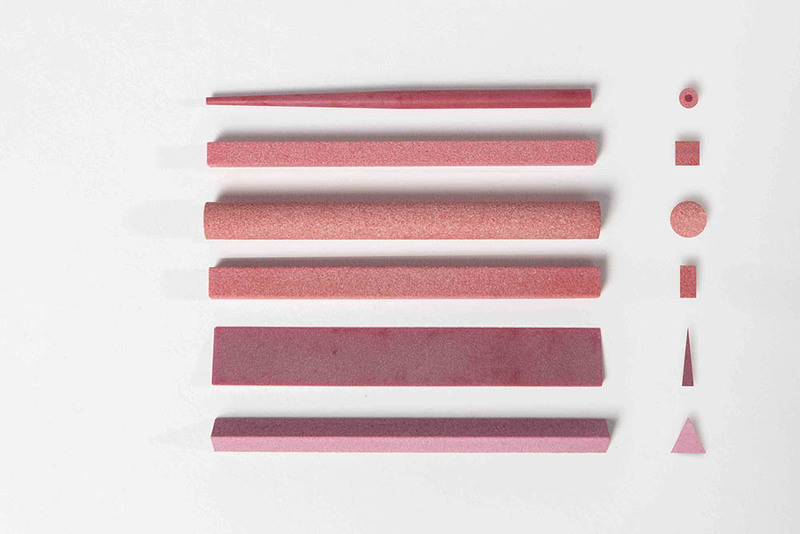 Because of their highly-sintered, bond-free, aluminum oxide structure, Ruby Degussits are the hardest of their kind available. This results in many performance advantages including great wear resistance (making them more economical than other stones), outstanding finish, and excellent profile and edge stability. They will not groove even after years of use. Ruby Degussit Files are ideal hand tools for all kinds of sharpening, deburring, polishing and fine grinding applications. Use them to sharpen any kind of tool, chamfer cutting tools, engrave profiles, and work hardened steel, carbide and other hard and abrasive materials. 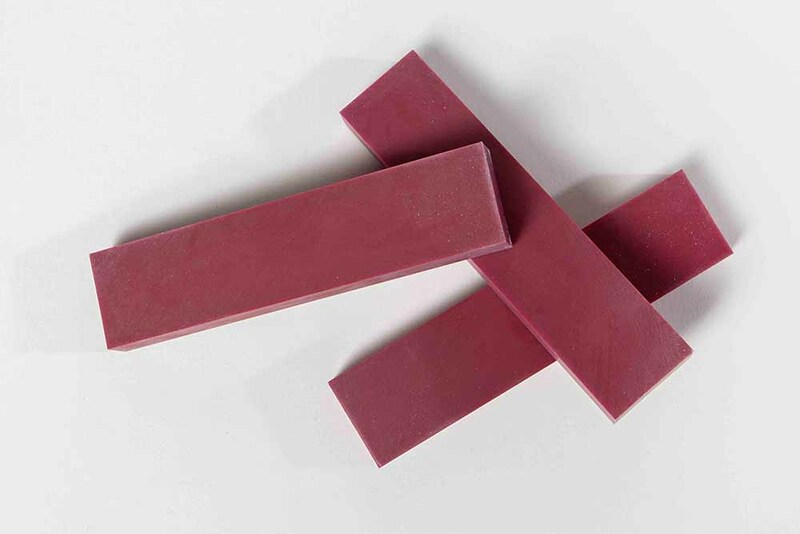 Ruby Degussits are also recommended for use on materials such as glass, quartz and porcelain. Mold and die makers use these stones in the production of cutting, bending and pressing tools, as well as for sharpening and deburring. Also ideal for sharpening knives! Ruby Degussits can be used wet or dry. When working "wet" Falcon Tool's Stoning Oil or Polishing Lubricant & Diamond Thinner make excellent moisturing agents. 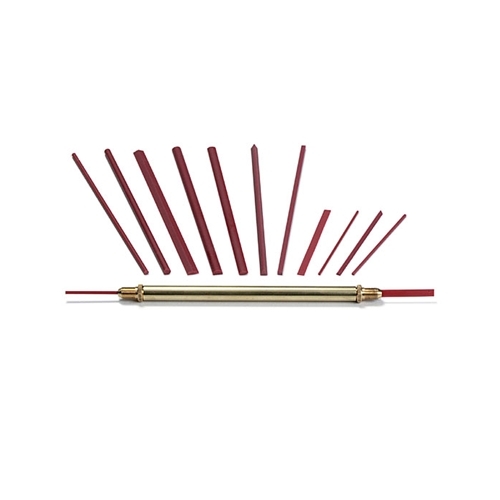 These tools are easily kept sharp by rubbing them with another Ruby Degussit Stone or file of the same or coarser type. A handlapper could also be used to keep them sharp. Ruby Degussit Abrasive Files Ideal hand tools for all kinds of sharpening, deburring, polishing, & fine grinding applications. Ruby Degussit Whetstones Use them to sharpen any kind of tool, chamfer cutting tools, engrave profiles, & work hardened steel, carbide & other hard and abrasive materials. The perfect tool for high detail & ultra-precision work. Ideal for deburring, blending, dressing, & fine polishing of molds & dies. Midget File Set Includes 11 Ruby Degussit Midget Files, 1 holder and 2 collets.